Mountain View Estates WWTP - Jewett, N.Y.
Mountain View Estates is a condo complex in the Catskill Mountains and within the NYCDEP watershed, which required a $3 Million dollar upgrade of the existing wastewater treatment in order to be compliant with the watershed rules and regulations. Project required upgrade of subsurface sand filtration to a new tertiary biological wastewater plant based around the Zenon micro-filtration equipment. Modifications to the existing collection system included pumped force mains, with two remote pump stations, buried aerated equalization basin with influent pumps and construction of a 50’ x 75’ pre-engineered building to house all process equipment. 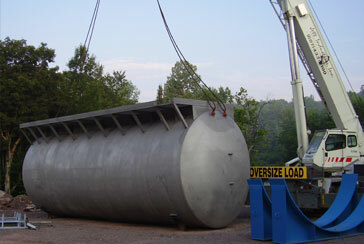 Process equipment included a 12’ diameter x 31’ long Zeeweed membrane bioreactor tanks with an 8’wide x 31’long auxiliary equipment skid for pumping systems and chemical feed. Two pressure sand filters and UV disinfection equipment provide tertiary treatment prior to discharge. Plant was designed for variable flow and to process wastewater in batch modes up to an average of 13,000 MGD a day. Full process performance testing was required prior to decommissioning the existing wastewater processes.